Traveling to California when responsible for a San Diego probate home in no simple thing. We all have our own busy lives, our own family, and all the responsibilities that come along. 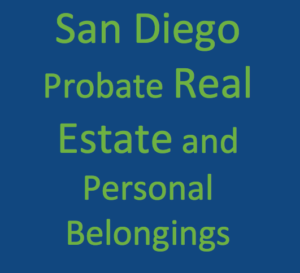 Some planning ahead will make the time once at the home in a San Diego probate easier. Reconnaissance will help with some direction, and by having an expert, a guide by your side, to help you with all the business associated with preparing, and selling the San Diego probate real estate is crucial. Beginning with the personal property, most San Diego executors, administrators, and trustees want help with the specifics of what’s valuable while also knowing that there may be an emotional toll ahead. Bob was appointed as administrator of his mother’s San Diego probate. He recently shared that sorting through his parent’s home made him face his own mortality. He was thinking about the passage of time, where he is in his life, where he’s been, places that he he’d like to visit but he hasn’t yet made it to, his regrets and successes. His sharing that with me was enough to make me stop and think. So, what he really wanted was clarity about his next, best steps, and he jokingly said he could also use a little therapy when it came to his mother’s personal property. We talked at length about his options, and the fact that dealing with the fundamental issues of his family’s loss, and because he loves his mother, the issue really wasn’t about the stuff. Bob realized that before he stepped into a room filled with his mother’s items, he needed to brace himself for the shock. Letting go of anything he had seen his mother use, especially as a child is hard because it’s embedded in his memory. When in the kitchen, he picked up a flour sifter and shared his memory of watching his mother make her delicious apple pies. We talked about how so many things that we own have power, and that flour sifter was no exception. Bob loved that memory of his mother, and decided to keep the flour sifter. Clearing out his mother’s home is part of a rite of passage that is significant, painful and necessary. A few days later he shared with me that what he realized is that he couldn’t keep all the things that had a memory attached to it, and although letting go was hard, he wouldn’t lose the memories. He chose to take photos of some of the things that were special, to him, and then let them go. He decided that it’s not the stuff that he was dealing with; but the stories behind the stuff. Some items had a story of where they were when the item was purchased, other things brought up a memory of people; the person that gave the gift or simply was there when it was acquired. His mother had a spoon collection, and he showed me the spoon with a star that his mother picked up in Texas. That spoon and the others carried some emotional charge. When sorting through the home in a San Diego probate, it’s important to remember that attachment is normal and healthy in human beings. When we lose someone, and go through his or her personal property, it can be painful because the objects are merged with the person. It also reminds us that everything in life is temporary. Knowing that everything can have a story eventually helped Bob to detach from each item. He then found his stride and the balance of pragmatism and respect.